If you can work outside, that would be the best idea, but if working inside, I would suggest covering a large amount of space with a trashbag, tarp, or other protective covering. 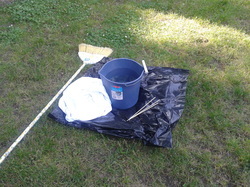 The broom/pole will be used to aid in the "dip-dyeing" process. I also had smaller sticks to use when stirring the dye. Prepare your dye and fabric. If you are using the boxed dye, you need to disolve it in a small glass of water (refer to picture next to supplies list above). Follow directions on box. 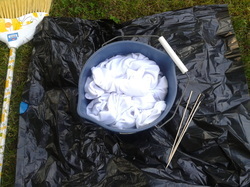 While the dye is disolving, you need to also wet your fabric. I did thisin the bucket before adding the dye. (Make sure you use warm water). You could also do this under the faucet in a sink. Once the fabric has been saturated, remove it from the water and ring it out. Make sure all of the excess water is gone. 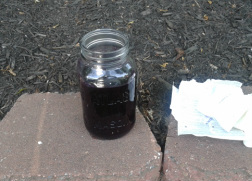 Mix your dye, and away you go! Once it is ready, mix your dye into the bucket you will be using. Pick up your broom/pole and rap about 2/3 of your garment around it and dip in the portion that you want to be the darkest (for purposes of the picture, which I was taking myself, I held the fabric). At this point you can either hold the broom and wait, or - if your a crafty engineer - you could rig up a holder with two chairs. You can leave the dress in for longer periods depending on how dark you want it to be, but you should always decrease the amount of time you leave each section in, otherwise, you will have a garment that is evenly dyed opposed to the ombre effect you are looking for. The amount of time may also depend on the dye color, so keep this in mind as your working. Once the entire garment has been dip dyed, take it out and ring as much of the dye out of it as you can then using either a hose or setting the garment up in the shower, you want to rinse the fabric until there is little to no dye running out of it. Make sure you are rinsing the garment with the darkest color pointing down, so that you are not running any extra dye into the lighter colors. Afterwards, you can wash and dry the garment. I always wash a dyed garment by hand the first time to ensure I get all the dye out, and then let it air dry. NEVER wash a dyed garment with other clothing the first time (and sometimes the first couple of times.) If you haven't gotten all the dye out, it will most definitely dye the other clothing you washed it with!